At the risk of flaunting my ignorance, I thought it might be worth discussing an interesting textual problem from the OT that I came across tonight. 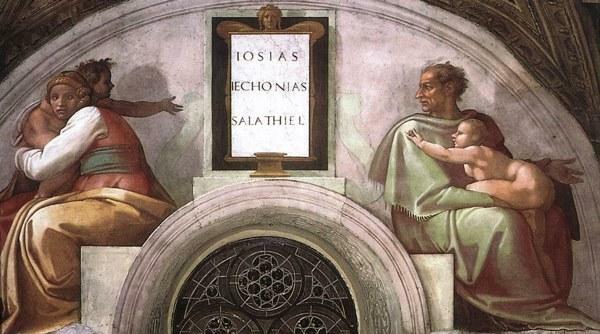 I actually stumbled on this while working on Matthew’s genealogy where Jechoniah is mentioned at the end of the second set of names and again at the beginning of the third (Matt 1.11–12). 9 Jehoiachin was eighteen years old when he became king, and he reigned three months and ten days in Jerusalem. He did what was evil in the sight of the LORD. 10 In the spring of the year King Nebuchadnezzar sent and brought him to Babylon, with the precious vessels of the house of the LORD, and made his brother Zedekiah (צִדְקִיָּהוּ אָחִיו) king over Judah and Jerusalem. According to the parallel text in 2 Kgs 24:17, Zedekiah was Jehoiachin’s uncle, not his brother. Therefore many interpreters understand אח here in its less specific sense of “relative” (NEB “made his father’s brother Zedekiah king”; NASB “made his kinsman Zedekiah king”; NIV “made Jehoiachin’s uncle, Zedekiah, king”; NRSV “made his brother Zedekiah king”). Jechoniah did have a brother named Zedekiah according to 1 Chron 3.16, but he did not become king so far as we know. Thus the problem which some translations solve through the alternate meaning of אח as “relative” or the like (cf. BDB s.v., def. 2). Translation, however, is not the only possible solution here. If we compare the ancient versions, the big three read “father’s brother” (Σεδεκιαν ἀδελφὸν τοῦ πατρὸς αὐτοῦ) or “uncle” (ܨܕܩܝܐ ܕܕܗ, Sedeciam patruum ejus) for describing Zedekiah, which in Hebrew would be אחי אביו. From there it is easy enough to see how we could arrive at the MT’s אָחִיו through the omission of אבי by parablepsis involving either the yods or the alephs and aided, perhaps, by the similarity of het and bet. I wonder what people think about this possibility. To me, the reading of the versions seems like a good contender for the original text on transcriptional grounds. At the very least it deserves a footnote in our English translations, doesn’t it? Of course, none of this explains why Matthew mentions Jechoniah’s brothers rather than his uncles as 2 Kings 24 would lead us to expect or why he omits Jechoniah’s father Jehoiakim (though note the vl in Matt 1.11). But that’s another topic for another day. Matthew also states (or at least implies) that Jechoniah was born in Babylon when he was not. Hippolytus of Rome (c. 202 CE) talks about this in his Commentary in Daniel 1.13: "How therefore is this declared? For Josiah, having reigned in the land of Judah thirty-one years, died there. How therefore is it possible that after he died there he begot Jeconiah in Babylon?" If anyone is interested, my translation of this commentary is coming out in a couple weeks with Gorgias press. It is the oldest Christian commentary we have extant, so I hope it will be of much interest. We will look forward to that, Thomas. Thanks. Out of curiosity, how does Hippolytus resolve the Matthean genealogy? According to Hippolytus, Matthew skipped a bunch of people because they weren't righteous. Evidently Hippolytus distinguishes two Jeconiahs, 1) the wicked Jeconiah who was the biological son of Josiah and whose name was also Zedekiah and 2) another Jeconiah who was born to Jehoiakim the biological son of Eliakim (confusingly known also as Jehoiakim) another biological son of Josiah. Also, Jehoiakim Jr. (grandson of Josiah) married Susannah. (1) Weber and Gryson's Vulgate has: Sedeciam fratrem eius at 2 Chron 36:10 (Zedekiah his brother [or cousin etc.]). If this is the reading, then the Vulgate would agree with MT formally, which is normal. I think you provided the Vulgate reading at 2 Kings 24:17. (2) The Aramaic Targum at 2 Chron 36:10 has ואמליך ית צדקיה אחוהי (and he made Zedekiah his brother [or kinsman] king). The Targum reads with the MT as we have it. (3) Peshitta agrees with OG because it was influenced directly by the Greek translation often. So it would be difficult to see P as an independent witness. It is of course possible that they arrived at the same translation independently through polygenesis or the same different Hebrew Vorlage you propose, and that leads me to my next thought. (4) As you (and the NET Bible) noted, אח, meaning "relative," is well attested in the Hebrew Bible. Why wouldn't one posit that the OG translated this word with the equivalent "uncle"? The translation would clarify any difficulty surrounding the word "brother." Nota bene the Greek translation at 2 Kings 24:17 υιον, but this might be a slightly later attempt to harmonize the Greek versions of 2 Kings and 2 Chronicles. But the meaning would be the same as long as "relative" is understood. (5) I don't think ח ב is an easy mistake to make transcriptionally. I would want to see more documented cases. (6) In my thinking, the MT's reading is lectio difficilior. If there is a variant here, and I'm skeptical of this possibility, it's harder for me to imagine the later scribe changing "uncle" to "brother." But I could more readily imagine a scribe clarifying any ambiguity over the term אח. To summarize: MT V T have "brother" but probably in the sense of "relative." OG (P) have what appears to me to be a slightly exegetical translation of 2 Chron 36 by recourse to 2 Kings 24. The Greek textual transmission history is still an enigma so this will remain a difficult question until 4 Reigns is sorted out. Meade, I agree that the MT is the lectio difficilior here because of the apparent conflict in relations and if Peshitta is just following the OG here then we may just have two ancient versional witnesses. (Note that the Clementine vulgate is what I cited above and is what is found in Φ according to Weber-Gryson's edition, for whatever that's worth.) I don't see the difficulty with my proposed omission though. Homoioteleuton or homoioarchton could both explain the omitted letters and we surely have plenty examples of that in the OT, don't we? I guess what I find most curious is English translations going with "brother" in 2 Chron 36.10 rather than "relative" for אח. As I said, at a least a footnote seems warranted here. Peter, I'm not sure what the value of φ in the Vulgate tradition is. I'm citing their text. φ's reading of patruus "uncle" probably represents an inner-Latin modification, harmonizing 2 Chron 36 with the reading of 2 Kings 24 in the Vulgate. So it's of limited value for TC of the Hebrew text of 2 Chron 36:10. There's nothing wrong with the proposed homoioteleuton/-archton. I was only casting doubt on the beth / het confusion. It is possible that one or the other of the putative two words in question could be omitted accidentally resulting in the text of MT. I completely agree with your gripe with the English translations here. "Relative" or "uncle" seems warranted in the text with a "Heb. lit. "brother"" footnote. The tendency to harmonize to 2 Kings is definitely the weakness of following the versions here. Even if they were all independent, the text of 2 Kings could mean they all agree because of a shared source of harmonization. But I still like my transcriptional solution a little. Sure. Or at least coincidence or shared exegesis of some kind may account for their agreement before positing a different Hebrew parent text. But just so we are clear on the Vulgate. Weber Gryson at 2 Chron is almost certainly correct. The other Latin witnesses are probably harmonizing to 2 Kings. So MT V T agree on "his brother/relative" here. Your transcriptional solution has some merit. I want to check a few more sources back at the office and maybe reply with more. But until then, I don't have much more to add now. Glad to see you exploring the texts of the rest of the Bible on this fine Friday morning. "Glad to see you exploring the texts of the rest of the Bible on this fine Friday morning."